A special exhibition of Japanese woodblock prints from the Haggin Museum’s collection, featuring interpretive content by Dr. John Listopad. This selection of more than 30 prints, known as ukiyo-e or “pictures of the floating world,” showcases noted artists such as Hiroshige, Kunisada, Kuniyoshi, Toyokuni and Utamaro. Traditionally, woodblock prints have been a popular art form for the masses, illustrating stories of lovers and courtesans from the pleasure quarters, popular kabuki theatre actors and their roles, great heroes in battle, parodies of classical literature and history, as well as landscapes depicting famous places and views. The Japanese prints in this show belong to three distinct periods and all are hand printed from intricately carved wooden blocks. 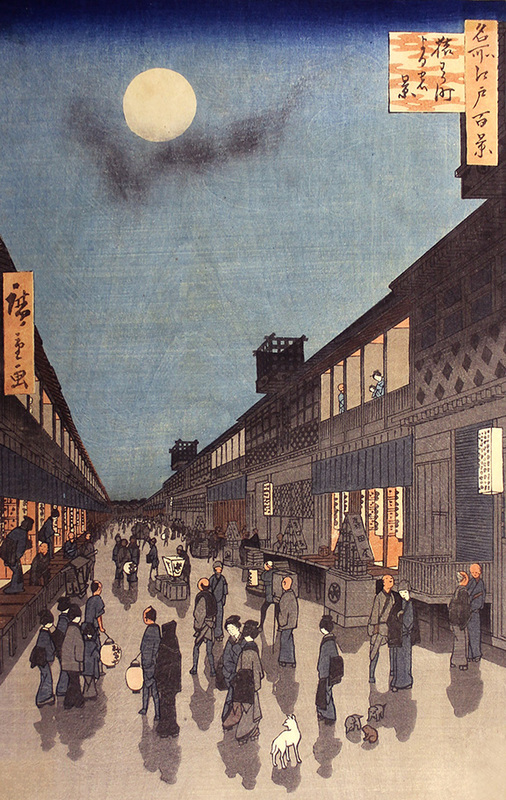 The earliest prints were designed and printed around 1700 in the old capital city of Kyoto. The vast majority of the prints are in an elaborate multi-colored style called “brocade prints” that might use as many as 15 fine-grained cherry wood blocks and multiple impressions from each block, a technique that began to be used around 1765. The third period represented in this exhibition is the “Shin-Hanga” or “New Print” woodblock print revival that was championed by the publisher Watanaba Shozaburo beginning in the early 1920s.